City Lights at 261 Columbus, 2005. THEY ARE TWO of the most vital political and literary radicals in North America and as it happens, two of the sweetest people you could ever hope to meet. Granted, my impression might be a bit tainted. Why, after all, would they be hostile to someone coming to do it congratulatory article on their City Lights Pocket Poets Anthology, which arks their 40th year of publishing from 261 Columbus? Even so, their warmth was disarming. Lawrence Ferlinghetti, 76, with his trim white beard, wearing a comfy cotton button-down, sits calmly opposite me, the window to his right. Perhaps he is savoring the last flavor from his espresso and half-gone biscotti. Though not as detached as I was warned to expect, he is wistful and yet listening, listening for a comment that interests him, while completely content, it seems, to say nothing. Nancy Peters, 57, with graying hair and a just-out-of-the-shower fresh face, sits across from me behind a stack of recent City Lights titles--Michael Parenti's Against Empire; First World Ha! Ha! Ha! a collective response to the Zapatista uprising edited by Elaine Katzenberger; and The Terrible Girls, a book of short stories by Lambda Award-winner Rebecca Brown--but if Peters is biting her tongue, waiting to pitch her challenging and quirky fare, I'd never know it. In fact, there's not a hint of NYC publisher/flack to her. No lapses into aloofness, eyebrows arched. Peters gives the impression that she is the one privileged to have your company, and she waits not to shill but to reply. 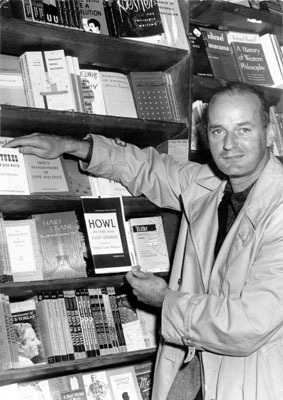 That Ferlinghetti, poet, painter, cofounder of the publishing house City Lights Books, and cofounder of City Lights Bookstore--and whose speech to the Bay Area Book Reviewers Awards in 1985 carried the apt title, "Publishers as Enemy of the State"--or Peters, who as executive editor of City Lights Books is directly responsible for up-to-the-hour calls to the ramparts, should turn out to be so nice, however, might not have been so remarkable if I weren't such a fool. You see, as something of a willful heretic I have expressed impatience, both in conversation and in print, with the beat legacy, for which City Lights keeps the eternal flame. To be sure, my backlash was partly motivated by a desire to incite controversy, but I was also personally fed up with what seemed an oppressive nostalgia. I mean, a few of the beats were dead beats (literally) before I knew their names, and a few others still occur to me as dead beats on the page. C'mon, I wanted to yell, could the booze and fog and love and loneliness really have been so much better then than they are now? And how come they always wrote about each other? Let's paint some fresh blood on the walls. Well, after a moment of self-flagellation (how could I have dissed such nice people? ), I got over myself and paid attention to what Peters and Ferlinghetti had to say. What I quickly gathered is that it is a major mistake to view City Lights as merely the Beatnik Hall of Fame. For one thing, City Lights has always had a policy not to publish only its friends--a decision the new anthology makes plain. 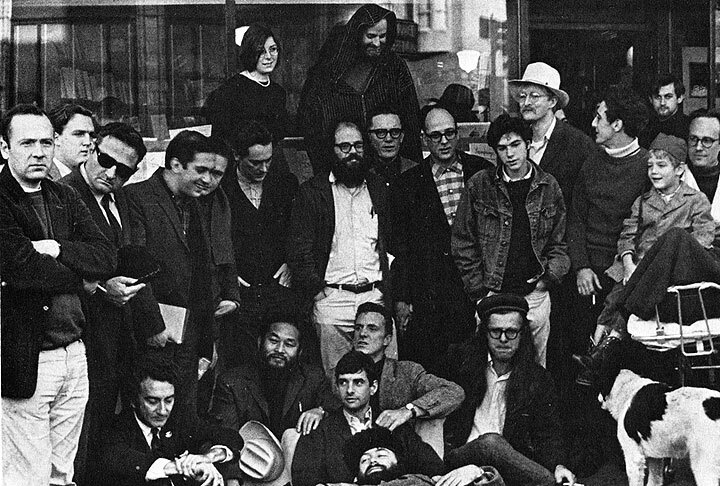 "From the beginning," writes Ferlinghetti in the introduction to City Lights Pocket Poets Anthology,"the aim was to publish across the board, avoiding the provincial and the academic and not publishing (that pitfall of the little press), just 'our gang.' I had in mind rather an international, dissident ferment. What has proved most fascinating are the continuing crosscurrents and crossfertilizations between poets widely separated by language or geography." Indeed, the anthology, drawing from the 52 Pocket Poets books, has poetry from Finland (Anselm Hollo), Chile (Nicanor Parra), France (Jacques Prevert), and Nicaragua (Ernesto Cardenal, Rosario Murillo), among other places. "Everywhere I travel, people know of City Lights," attests Juvenal Acosta, a Mexican American poet and editor of Light from a Nearby Window, an anthology of 21 Mexican poets that was published last year by City Lights. "By people, I mean people who care about books. And for them, City Lights is like a cathedral." No other U.S. publisher, Acosta says, has the tradition of publishing foreigners or, as a result. the standing City Lights has among writers. "The reason City Lights publishes foreign poets," Acosta says, "is not out of political correctness or some multicultural guilt but from a true sense of cosmopolitanism. Sometimes Central American writers will get published in the U.S. for the wrong reasons. But not by City Lights. Excellence always comes first." It's true, Acosta says, that some only think of the beats when they consider City Lights, "but they aren't publishing any beat poetry, except in the anthology, and then it's with many poets who are not beats." And, he might have added, even the beats in the anthology, including Allen Ginsberg and Jack Kerouac, Diane Di Prima and Bob Kaufman, are not represented by their greatest hits. A literary meeting-place since 1953, and the first all-paperback bookstore in the U.S., legendary home of the beatniks, publisher of Allen Ginsberg's HOWL, owned by Lawrence Ferlinghetti and Nancy Peters. Contrary to what some have intimated, I also learned that Ferlinghetti established himself as a poet in his own right outside his affiliation with the beats. In fact, of all 44 poets represented in the Pocket Poets Series, only one poet has outsold Ginsberg in North America: Ferlinghetti himself. And, as if to underline Ferlinghetti's own accomplishment, the very first title in the Pocket Poets Series was his own work (recently rereleased with 18 new verses), Pictures of the Gone World. "The first one was handset, Ferlinghetti recalls, and gestures out the window down the street. "I took it to a printer who had a shop right at the foot of where the pyramid building is today, David Ruff. We used a letterpress and we hand-stapled 500 copies." Because paperbacks did not have status as "real books" at the time, Ferlinghetti actually shipped a couple future Pocket Poets manuscripts to Germany, where paperback-binding equipment had already been developed. Peters smiles at the memory of early hands-on production. "I'd be there with a razor blade and rubber cement and Ginsberg would call with changes between proofs and ask, 'How about this? ' Though computers have made last minute changes less hectic, Peters laments that poetry once had more "texture." Now, my emphasizing Ferlinghetti's original DIY accomplishments at City Lights or his own independent success with the New York publishers who published his Coney Island of the Mind is not to say he wasn't shrewd. As his biographer Barry Silesky notes in ferlinghetti: the artist in his time (Warner Books, 1990), Ferlinghetti wrote in his journal, circa 1952 (the year before he went in with Pete Martin on the store and two years before he heard, and then solicited Allen Ginsberg's manuscript for, Howl and Other Poems), "If I could find a J.W. Turner to champion, I might be a great art critic." Clearly, instead of a Turner, he found a Ginsberg. And by championing Ginsberg, he did secure greatness. But what publisher in Ferlinghetti's position wouldn't have championed Ginsberg? 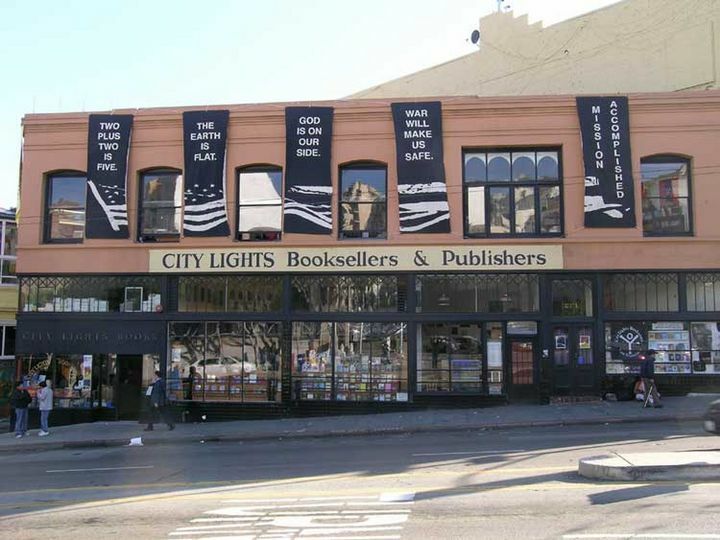 In fact, another publisher was interested in Howl when Ferlinghetti persuaded Ginsberg to let City Lights publish it. Luminaries of City Lights scene in front of the store, December 5, 1965. What must really be stressed however, for those who may consider City Lights Books beat-centric is that poetry, much less beat poetry, only accounts for 20 per cent of' the books City Lights publishes today. 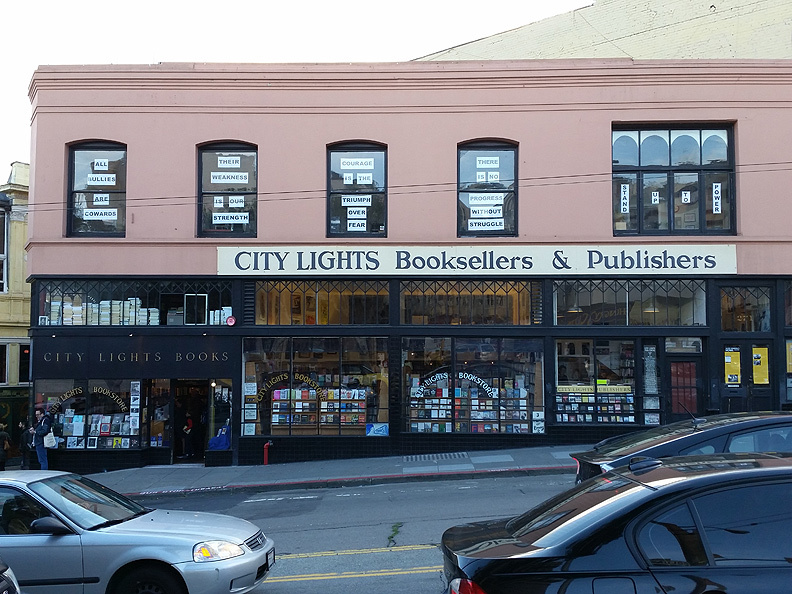 On the strength of its backlist, City Lights has built a business that doesn't need to rely on grants or patrons to publish dissenting voices, voices that are too risky or not commercial enough. "Our intention is to publish the dirty truth and to be a voice for social responsibility, " Peters says. "And [the books of dirty truth] do find an audience. The Parenti book, for example, is already on its second printing [since spring 1995]." 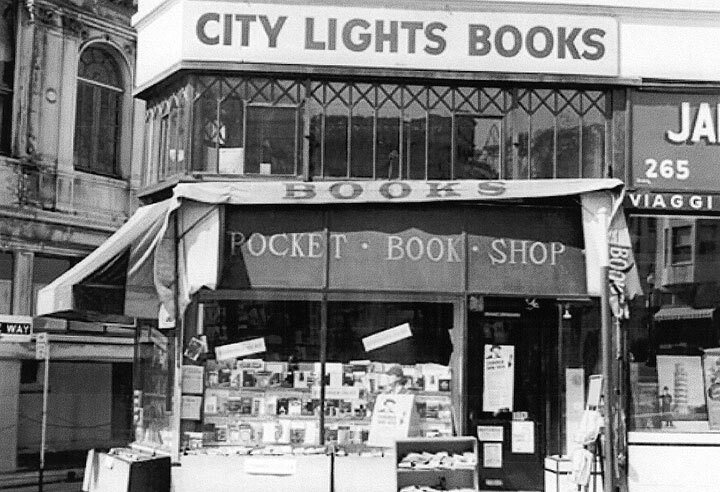 "It always surprises me that others don't do this," Ferlinghetti says, referring to City Lights' business model of using the profits from a bookstore to subsidize a publishing imprint. "Having a bookstore is a real advantage. In Europe, some of the biggest publishers began as booksellers." For one thing, Peters says with a smile, "You know at least one place that will sell your books and carry your backlist. Over the years Ferlinghetti has advised writers against accepting National Endowment for the Arts (NEA) grants. "It's hypocritical. You have these small presses and writers taking money from the government... I think this is guilt by complicity. I think that this principle--Albert Camus's--is still a valid principle. Some people disagree, I know. One poet said, 'You own a bookstore, you can afford to take a purist position,' but what he is saying is, I can afford liberty." Liberty, to Ferlinghetti's mind, is not predicated on cash. 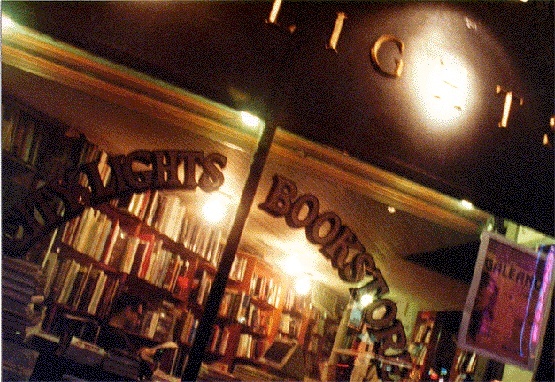 City Lights Books window on Columbus, mid 1990s. Our interview nearly concluded, I noted that defining a dissident role does not come easily for folks under 30 today. The rebellion part doesn't take much imagination, but making it constructive does: Various forms of protest have been transformed into consumer choices, their moral imperatives blurred by media saturation. How, I asked, does one go about being a dissident? Peters, appearing to reflect briefly on 25 years of editorial and logistical effort, pointed to the books in front of her. "I think the answer is in here, or at least this is our way of getting down to answering that question." Ferlinghetti, his brow as knitted as it has been all morning, says, "There are still clear choices." Pausing, he added, "I guess they can sort of get buried, and advertising and all does make it look all right to choose to comply... [And yet], you know, I'm often asked if there is a beat revival, and my answer is, 'How can there be a revival when they haven't ever left?' I don't think what the beats were saying [is irrelevant], that their rebellion--I think it's just as valid today as it ever was." City Lights in February 2017.